Order in next 8 days for Christmas delivery. I thought this website was about finding deals and not going into the politics of a company's actions. I thought this website was about finding deals and not going into the … I thought this website was about finding deals and not going into the politics of a company's actions. I won't be buying anything from them again. I agree but it does matter how people are treated at a company and it may sway some people on whether they want to give their custom regardless of the deal, just look at what's happening right now with Amazon workers in Scotland. It's only fair to let people know so they can make an informed decision. Some deep discounts on stuff that's already pretty cheap, i.e.. nuts and bolts that are a few quid. Didn't really see anything interesting there myself. Heat anyway though, maybe something in there. Dont forget you 2.2% cashback on your 10p spring washer! Jinx! You beat me to it! I don't think Quidco applies when you use a discount code having read the T&Cs on Quidco's website, otherwise I would have added the info and link in my original post. Please correct me if I am wrong. this just seems like their standard discount? Didn't realise that - good to note! I don't think Quidco applies when you use a discount code having read the … I don't think Quidco applies when you use a discount code having read the T&Cs on Quidco's website, otherwise I would have added the info and link in my original post. Please correct me if I am wrong. Large company takes over smaller thriving company and decides to close it down to eliminate the competition result hundreds of hard working workers who made Chain Reaction such a success are thrown on the scrap heap in a high unemployment area,now the takeover company get to make more money charging higher prices due to less competition. To add insult to immoral actions the take over company have the soon to be unemployed workers work their n*ts off coming up to xmas by clearing unwanted stock. Large company takes over smaller thriving company and decides to close it … Large company takes over smaller thriving company and decides to close it down to eliminate the competition result hundreds of hard working workers who made Chain Reaction such a success are thrown on the scrap heap in a high unemployment area,now the takeover company get to make more money charging higher prices due to less competition.To add insult to immoral actions the take over company have the soon to be unemployed workers work their n*ts off coming up to xmas by clearing unwanted stock.Merry Christmas Everyone. ​and Amazon workers live in tents and work 16 hour shifts on zero hour contracts. I don't really get the relevance. Thought this was a bargain website as opposed to a moralistic one? Customers aren't stupid, people buy stuff from whereever cheaper. 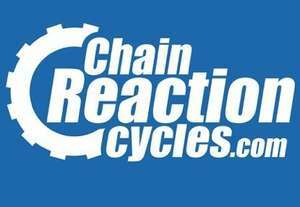 If CRC's price goes up there dozens of other online cycle retailers to choose from. Now loads of stuff are at very good price at CRC so this is a damn hot deal. In addition, Companies make money, they just don't care about unemployment if they can make more money by firing people. Also being employed means you do whatever you are told to do from your boss including getting fired, simple as that, it's business not charity or something. I agree but it does matter how people are treated at a company and it may … I agree but it does matter how people are treated at a company and it may sway some people on whether they want to give their custom regardless of the deal, just look at what's happening right now with Amazon workers in Scotland. It's only fair to let people know so they can make an informed decision. The amazon news is totally a joke. How many people really sleeps in tents and for how long? Those people must have know how much they could earn before they taking the job, right? It was their choice to sleep in tents and I don't see the point of accusing Amazon at all. For sure if they could get better paid jobs elsewhere they would have done that right? What company pays salaries based on employees' living situation? Should all company just pay more salaries when their workers complaining about they can't afford live in better places or can't afford better transportation? Well for sure these people have the choice to just quit right? and amazon won't have problems with that at all because jobs will be easily be taken by others any way.